Fortunately, help is at hand. 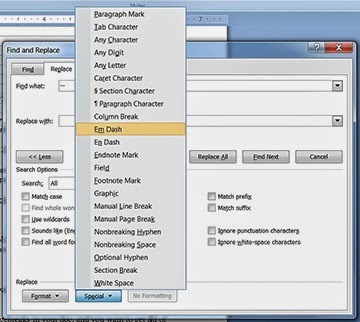 Using MS Word’s Find and Replace feature in conjunction with nonprinting character codes, you can quickly and easily carry out global fixes on just about any formatting problem you’re likely to face. 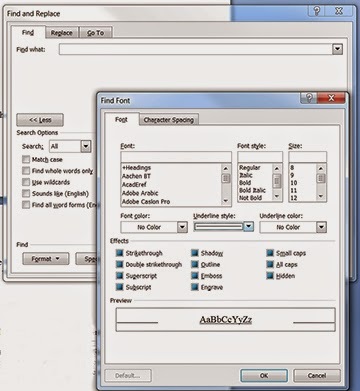 Spaces, tabs, paragraph marks, and breaks—also known as nonprinting characters—are normally invisible in a document. 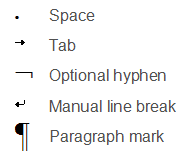 To make them visible on the screen, simply click the Pilcrow (¶) button on Word’s Home screen paragraph group (location will vary according to your version of Word: to find it, enter “Show or hide formatting marks” in the Help menu search box). NOTE: Make a copy of your working doc file and save it under under a new name before beginning, just in case. Don’t take chances! Now click Replace All. Bang! they’re gone, all of them—it’s that simple. But, oh, you wanted to replace those page breaks with something to stop text getting scrunched up? Piece of cake. Just enter a paragraph return (^p) in the Replace field instead of nothing. Quotes and Italics and Dashes, Oh My! Depending on your Word settings and the font you’re using, you may find your doc has a lot of double hyphens for em-dashes. To convert these easily, simply enter two hyphens in the Find field and the code for em-dash (^+) in the Replace field. Hit Replace All, and it’s done. Quotes are also no problem. Sometimes—especially if you switch computers—you’ll find that a document has a mix of both straight and curly (aka “smart”) quotes. Again, it’s a simple fix. TIP: Explore the “Special” menu at bottom of the “More” dropdown as well—it’ll insert codes for various characters for you. All the underlined words should now be italicized, with no underline! NOTE: After using items from the Format menu, you’ll need to click in each field (Find and Replace) and hit the “No Formatting button at bottom to clear formatting instructions, or you’ll have trouble later. 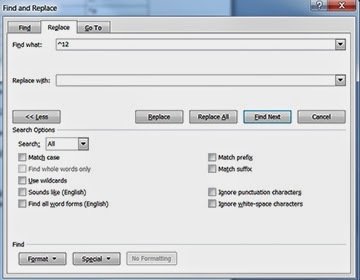 Now that you’ve got the basics, you can easily work out stratagems to use the codes, the Format, and the Special fields in Word’s Find/Replace tool to address other issues. One good idea is to type up a practice doc with lots of problems and just experiment. Have fun! Did these notes help you? Have you run into these or other, perhaps weirder formatting problems? Do tell! Dario Ciriello is the founder and editor of Panverse Publishing, a small press with a mission to break the rigid barriers of category and genre and put story first. His Panverse Anthology authors have been nominated for both Hugo and Nebula awards, and the winner of the 2011 Sideways Award for Alternate History. On the novel front, his authors include T.L. Morganfield, Bonnie Randall, Doug Sharp, and Don D'Ammassa. 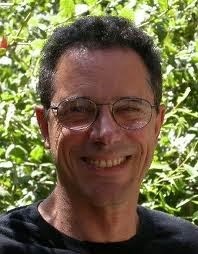 His own work includes Sutherland's Rules, and the travel memoir Aegean Dream. Panverse is currently open for submissions. That is a lifesaver. I never realized you could search for formatting problems that way. Thanks. Thank, Southpaw! Yeah, I was driven to experimenting by despair in the first place LOL As a one-man indie publisher, I have to deal with formatting novel-length work all the time. Without these tricks, I'd be dead! Great tips! I've tried changing quotes and smart quotes, but didn't know how it worked. Thanks! Thank you, Deb :) Although one can set "Autocorrect as you type" options to generate new smart quotes as you go, this is the best (and only) fix for existing quote problems. In an ms. with maybe a thousand or more lines of dialogue, fixing them one by one is... horrible. LOL. OMG, this is invaluable! Thanks so much for summing this up so clearly. Wonderful post! Thank you! I have all of these tips - on twice as many postits in 14 different places. As I've encountered and learned, have jotted the clues down - so great to have them all in one place with clear guidance. LOL! I know what you mean, Maria--the postits can get totally out of hand (though they do have a certain decorative value :) Glad you found this post helpful! You can do all this in Mac Pages, too. Heck, I never thought of doing this! I've only used find/replace for words. I didn't realize I could use it for formatting changes. Thanks so much for these tips. I use Apple Pages, but there are a lot of similarities between the two programs. Thank YOU, Julie! It took me a while to work it out myself... but I'm a compulsive menu-poker and problem-solver. It does seem that MS and Apple software (and Scrivener too?) seem to be increasingly aligned. Terrific that these tricks are transferable! You're so welcome, ChiTrader--I'm glad to have the opportunity to share these tips! And here I thought the “typing a quote following an em-dash yields an open quote instead of a close quote” was a Mac only problem! (My characters get interrupted a lot, LOL.) I find that in Scrivener, typing the quote mark, then backing up a space and adding the two dashes (converted then to an em-dash) does that trick. But for any readers using Open Office: OO uses regular expressions for seek and destroy, and just as an example, the ^p has no equivalent that I can find. Otherwise, the techniques are similar to Word. But I’d make a strong recommendation for readers to look at Scrivener; it has considerable utility and flexibility (for example, a menu command to replace straight quotes with smart quotes—and reverse, if that’s what you need! Thanks for the excellent run-down. Clarification: Autocorrect as you type will only convert characters typed *after* enabling the menu option, not retroactively, which is what Search and Destroy does.